Imagine being lulled into a state of tranquillity at the sound of drum beats. This is a condition identical to that of a baby within its mother’s womb, being granted the solace of protection with the regular beat of its mother’s heart. This would be an ideal situation to remedy the ravages of modern stressors and the emotional wear and tear of daily life. A drum circle provides that nectar of life to revive mind and spirit of many an individual weathering a tumultuous life. among the numerous tribes. Music and beats are part of their daily routine – be it walking, hunting, farming, etc. The Djembe, a percussion instrument typically used in a drum circle is also referred to as an African Conga. Mickey Hart, ex-drummer of The Grateful Dead, and Arthur Hull are prominent among those who have contributed to the drive of the drum circle movement in the western world. In a drum circle you have people of all walks of life coming together and drumming away to relief. You do not need professional training or even a tad bit of musical knowledge and experience to participate. Every individual is born with a beat. Drum circles encourage people to find that inherent beat and explore themselves in a way that they never have before. It gives them a sense of accomplishment in realising their true potential. It involves making music, discovering your rhythm and interacting socially on a whole different level. In Goa, we have our own homegrown drum circle facilitator in Arthur Fernandes. He is from Ponda but at present shuttles between Goa and Pune. Arthur graduated in Abnormal and Developmental Psychology and thereafter pursued his Master’s degree in Industrial Psychology. After a brief tenure in the human resource department of the corporate sector, Arthur chose to do a course on arts based therapy. Here he absorbed the details of the manner in which various arts could be used as psychological therapy. These forms include dance, music, drumming, storytelling, painting, play, etc. Professionally, he now titles himself as a psychologist, an arts based therapist, and a drum circle facilitator. Music has been an integral part of Arthur’s life’s journey. Beginning with drums at the age of six, he honed his percussion skills denting and breaking a few vessels along the way. A turning point arrived in his life when he met with a horrific accident involving a Volvo bus, a car and his bike. The bus rammed into the car accelerating its movement towards Arthur’s bike. He was flung from his bike and left for dead. He realised that his soul had left his body and experienced sublime peace and oneness with the environment. He soon found himself back in his body with the familiar sensation of human pain. After this near death experience he decided to devote his talents to the betterment of his fellow beings, using them optimally so. He now teaches drums, guitar and gives voice lessons. Besides handling a clinic in Pune, Arthur serves as guest faculty at management institutes, is a motivational speaker and occasionally assists in solving cybercrimes. 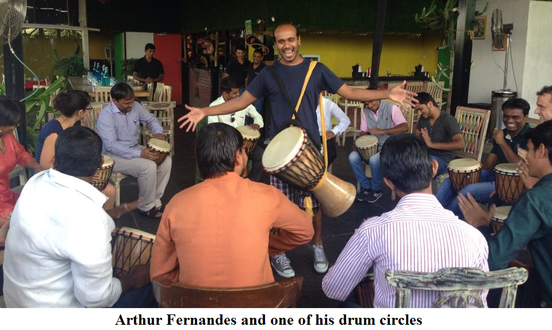 Arthur has facilitated drum circles in Pune, Goa, Bangalore and Mumbai and has done it for people from various backgrounds like chefs, CEOs, kids, doctors, classical music appreciation clubs, youth clubs, psychiatrists and others. He has also facilitated them for clinics, workshops, annual functions, parties, weddings, etc. Arthur reveals, ‘Drum circles play an extremely significant role in Psychology. They rejuvenate an individual and encourage them to open up. Introverts start to become extroverts.’ This is because a tremendous amount of communication takes place throughout the session. Participants who have special needs have shown marked improvement in dexterity and movement. Arthur has complete faith in the ability of drum circles to help even in cases of autism, Alzheimer’s and dementia. After having facilitated numerous drum circles for NGOs, corporate houses, communities, etc., he is convinced that a one hour session of a drum circle is equal to ten to fifteen sessions with a psychiatrist, psychotherapist, hypnotherapist or anyone else. So powerful is the impact of drum circles that the transformation becomes visibly apparent. There is tremendous stress relief; building up of leadership qualities and team spirit; encouragement of creativity, skills of improvisation, problem solving and innovation; self-esteem is enhanced and self-expression explored. Drum circles are effectual in converting all things negative into something positive. Another instance of a drum circle’s effectiveness is an episode where a lady suffering from diabetes began drumming in a community drum circle. She enjoyed herself immensely. She started off with a high blood sugar level but after the session when she checked it again she found it had reduced by 100 points.